M6 was a long milestone - there was one extra week of development - and hence we could do a little bit more. There are quite a few new features and a few API additions as well. 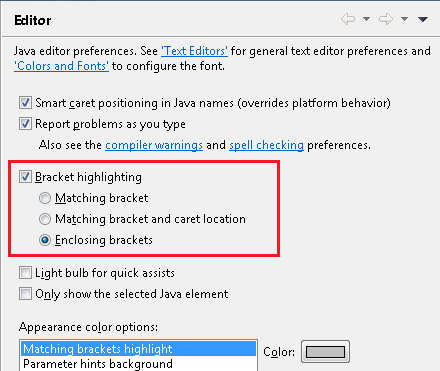 The bracket matching support in Java Editor has been improved, and among other things it now supports highlighting of enclosing brackets. This can be configured on the Java > Editor preference page. Null analysis treats org.eclipse.core.runtime.Assert like Java assert. You can read the complete list here. @Marcel Let us know if you still find something challenging. In http://goo.gl/n5eT6 I've put the subclasses of existing IJavaCompletionProposals in which we made a few changes to widen the "IsPrefix" checks. Unfortunately, there are a few final classes which forced me to create a complete copy of the final class instead of subclassing and adapting the isPrefix method (see http://goo.gl/3Bx8f for one such example) Is final required for these classes? These IJavaCompletionProposal types you refer to are for code completion, and not quick fixes, right? In general, we in JDT do not make stuff API (or non-final) unless asked for. From a quick glance at LazyGenericTypeProposal, I do not see a reason for it to be final. You can open bugs for stuff which you think can be API, and we can discuss on a case by case basis. Nice. Looking forward to using the new bracket highlighting.